Answer the Question "What Happened at School Today"
grades, attendance, behavior, homework, referrals, school news and more. Progress reports go home as often as once per week, daily reports are available in the parent portal every night. 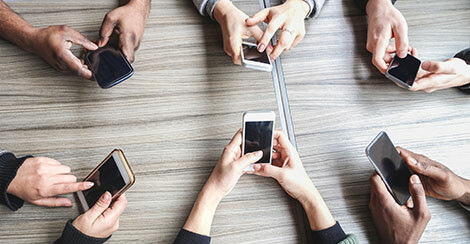 Connect with parents in the method that's best for them: paper handouts, parent portal, e-mail, text or voice message. 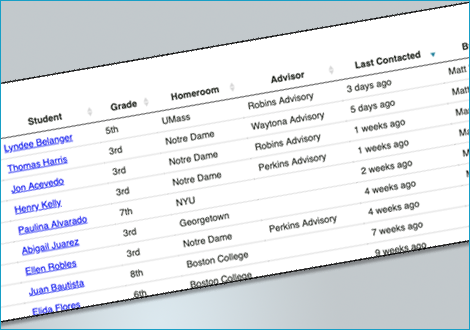 With DeansList, teachers can easily log conversations with students and families, and view those made by other staff. This makes it easy to continuously follow a student's progress, a family's relationship with the school, and identify students who would benefit from more positive encouragement. Get in touch with families in whatever way works best for them: phone calls, emails and text messages, all built right in, with automatic translation into a parents home language. 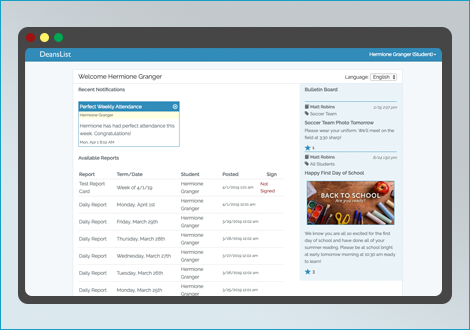 Schedule messages to go out automatically based on attendance or behavior, or for students who've earned rewards or consequences. 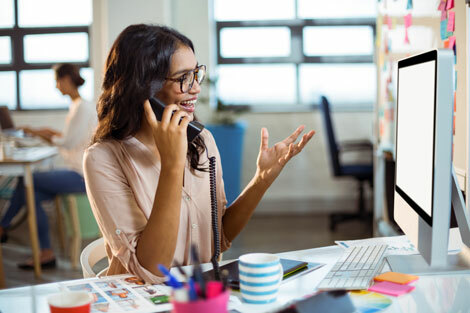 Contact info can change unexpectedly, but finding the right number to call shouldn't take longer than the call itself. With DeansList, your whole school's directory is available right in our app and is always up-to-date. Who Needs as a Call? Identify families who haven't heard from the school recently and are in need of an update. You can also create "reasons" for teachers to check off why they get in touch (i.e. "Positive September Check-In" or "Post-Conference Followup") to make sure you hit 100% coverage. The more info families have, the more they can work with you to help their children succeed. With DeansList, a complete picture of the week including attendance, grades, homework and behavior is just one click away. Our Family Portal is a great way to keep families engaged and up-to-speed. Family Engagement Integrated. With DeansList, nothing lives in isolation. 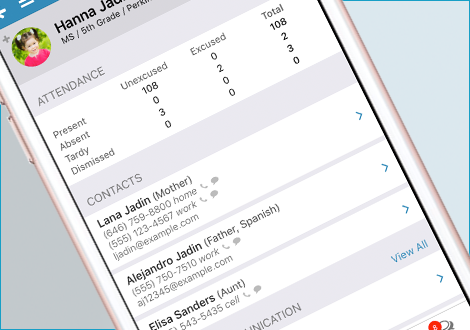 It's easy to send home updates on behavior, homework, grades and more without the hassle of spreadsheets or data manipulation.